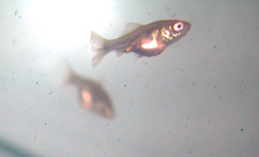 Baby goldfish fry when they were born are no bigger than a tiny thin hairline that measure less than 3mm. In fact if you didn’t see them carefully you might not even notice that those are young baby fish in the first place. During the first few weeks after they have hatched, those are the times that are the most critical to their survival. During this period, they are exposed to all kinds of threats that will harm and kill them and the biggest problem so far is flukes and skin disease. So despite all that, how do we ensure that we successfully raise a young goldfish fry to become an adult fish? 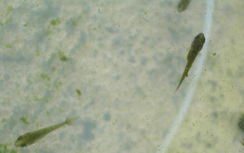 What you feed to them is very important and it is the most critical aspect to look into because you will want your baby goldfish to grow as quickly as possible to be able to withstand wave of disease outbreak. The safest and most nutritious food which you can give to them is powdered foods and you can also use green water which you need to leave under the sun until it is slightly greenish and scoop up the water to your goldfish fry tank. What you are providing to them is basically mix of algae and processed food and I find that this combination is the best so far for goldfish between 1 to 3 weeks old. Most people will rush to the store and get a liquid processed baby fish foods but if you decide to save some money, you can always try a different approach. 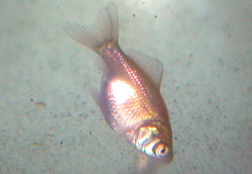 Dry pellets which you normally give and feed to the adult fish can actually be used as an important supplement for their diet. I would recommend using sinking fish pellets because those are usually made from high density protein filled with wheatmeal rather than filler (usually flour) which normally offers no additional nutritional value. First, what you will need to do is to soak the content until it is fully submerged in the water for at least an hour in a small container and then using your index finger, crush and then swirl in order to dissolve the food and make it into fine solution. Don’t worry if you think that what you have created is a just a cloudy water but what you are actually doing is making a solution filled with powdered foods which the fry will greedily feed from it. Don’t worry if you can’t see it because the baby fish will. :) In fact, this is exactly the same as what you will normally get when you buy the liquid fry foods sold in bottles. For further discussion, you might want to read up about what are the additional foods to feed your baby goldfish so that they reach adult size as soon as possible. Fish medication is another important area that you should always be prepared. In fact, I always have my bottles of fluke medication ready at hand in case I notice that the baby goldfish fry start to die in large numbers. Based on my research the number one killer that causes you to lose your batch of fry is actually fluke itself. Don’t confuse yourself thinking that since you have not added any new fish, it would mean that there is no risk or potential to introduce disease. However, this perception is totally wrong because fluke as I know it, is always present in every fish regardless of how young they are and where you got them from. It can be present in our freshwater even though we have properly treated it and it will stay onto the body of the fish until the time is right, and when the body weakens, fluke disease will find an opportunity to develop. So what is fluke disease? Water quality is also another thing that you shouldn’t forget regardless of whether you are raising young fish fry or whether you are keeping an adult fish. Changing the water of your baby fish tank is somehow challenging and since you can’t see them, you shouldn’t use the normal approach of siphoning the tank because you will risk siphon out the baby fish as well! The most sensible and workable approach is by using a transparent or white bottom container and then scoop out the water. Check whether there is any fry inside it before throwing away the water. Remember maintaining good water quality is always one of key factors towards survival and successfully raise your batch of young baby goldfish. You might also want to check out tips that I use to maintain perfect water quality by doing routine water changes and how to get crystal clear water. Finally, as a goldfish breeder myself, I’ve learned through experience that most of the time only about 30% of the fry actually made it to adulthood and survive to become breeder fish. About 5% are born deformed, another 60% will die due to disease (as what we would call natural selection) and the rest of 5% die due to other reasons. I’ve even experienced losing a whole season batch of fry due to outbreak of disease which totally went out of control.